Innovative and aesthetically-designed, our 270-series outdoor APs deliver fast and reliable 802.11ac Wi-Fi performance under any weather conditions. The three-stream 270 series also enables 802.11n mobile devices to operate up to three-times faster at the same distance from the AP. Purpose-built for the harshest outdoor environments, 270-series APs can withstand extreme temperatures, persistent moisture and precipitation, and are fully sealed to keep out airborne contaminants. The 270 series is as simple to install as an outdoor video camera and features integrated antenna options for easy deployment. Extend the performance benefits of beamforming to outdoor environments, where maximizing the range of Wi-Fi is most critical. 270-series APs – with or without external antennas – are totally unobtrusive and look just like any other common outdoor fixture. View all the part numbers and accessories you will need to order a 270-series AP. Which AP is Right for You? View and compare Aruba's complete portfolio of enterprise wireless LAN APs. 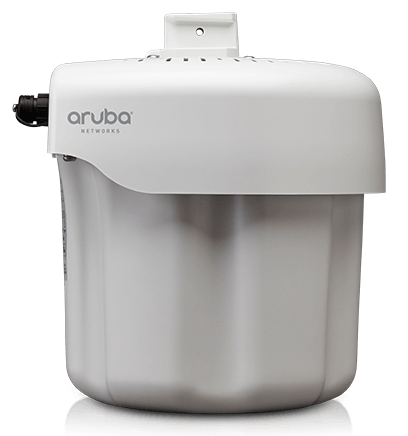 Aruba 270-series APs look sharp as they extend 802.11ac gigabit Wi-Fi outdoors. In addition to 802.11n data rates, the 2.4-GHz radio supports 802.11ac data rates using 256-QAM modulation. This gives TurboQAM-enabled clients a 33% boost above the maximum supported data rate to deliver up to 600 Mbps. Maximum power consumption: 23 watts. Six N-type female connectors for external antennas. Six integrated omni-directional antennas for 3×3 MIMO with maximum antenna gain of 5 dBi in 2.4 GHz and 5 dBi in 5 GHz. Built-in antennas are optimized for horizontal mounted orientation of AP-275. Six integrated multipolarized directional antennas with 80° H x 80° V beamwidths for 3 x 3 MIMO with maximum antenna gain of 6.5 dBi in 2.4 GHz and 5GHz. AP-270-MNT-V1: Aruba 270 series AP long mount kit for pole/wall mounting. Reduces impact of obstruction by pole or extends away from corner. For more country-specific regulatory information and approvals,	please see your Aruba representative. Whats the difference between 274 vs 275 vs 277 in layman's terms?